Region: This beetle is found in Eastern United States and southern Canada with similar species throughout North America. Life cycle: This beetle produces one to two generations every year. The adult beetles hibernate in the soil or in garden debris. 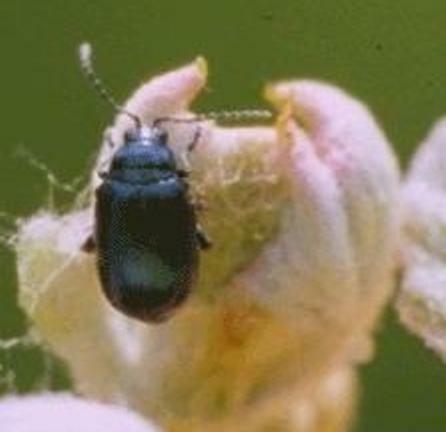 Physical Description: This flea beetle is green or metallic blue and is only 1/12 inch long. The larva is yellowish with black spots and is very tiny. The eggs are laid in the soil or on weeds. Feeding characteristics: The adult beetle prefers the small young leaves of host plants. The damage appears as numerous small holes. 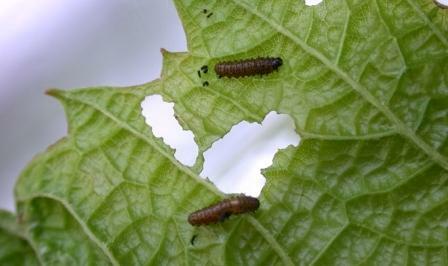 The larvae will also chew on leaves and buds. The plants preferred by this beetle are the apple, blueberry, grape, plum, and strawberry. Controls: This beetle does not usually cause enough damage to be of concern, most plant can handle the loss of some leaves or leaf area. However, if the damage is intolerable, then dust with rotenone.